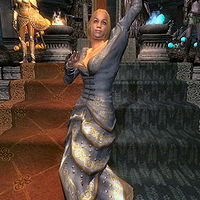 The Dancer is an Imperial commoner who appears in Sheogorath's throne room after The Prince of Madness quest is completed. Most of the time she stands to the left of the throne, but when Haskill is asked for Entertainment she will walk to the central area and perform a dance. This is purely an aesthetic effect and has no impact on any other area of the game. Her only possession is her light blue regalia. This page was last modified on 20 October 2015, at 06:31.